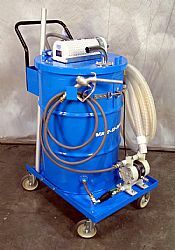 VAC-U-MAX provides solutions for the metalworking industry with its complete industrial sump vacuum cleaner system that increases coolant life as well as extends machine tool filtration systems by cleaning fluids and removing metal chips and swarf at one to two gallons per second (60-120 GPM). Operators can quickly empty machine tool sumps, machining beds, oil/water separators, parts washers, rinse tanks and clean up liquid spills. Solid particles are separated from collected liquid with the VAC-U-MAX chip basket and liner. With the turn of a lever, this industrial sump vacuum cleaner will pump out the liquid contents of the drum through the discharge hose to a central filtration system for coolant/oils or approved floor drain up to 14 gallons per minute. Use of these vacuums, commonly referred to as a sump sucker, reduces the amount of accumulation of chips and fines in the sump reducing bacterial and fungal growth keeping workers safer. These systems are also ideal for larger metalworking jobs, such as high-speed milling of aircraft wings, where fluid must be removed from cavities in order to take precision measurements. The air operated portable industrial sump vacuum cleaner allows operators to return coolant to the machine tool sump, or transport the vacuum to a central sump pump filtration system. The dispensing nozzle on the pump-out hose puts you in control of where and when the fluid comes out, reducing operator exposure to bacteria and dermatitis when emptying machine tool sumps, machining beds, oil/water separators, parts washers, rinse tanks and cleaning up liquid spills. Dual swivel casters makes the 26” wide unit easy to move and its compact size gets close to the machine tools and sumps keeping vacuum hoses as short as possible. The smoothbore hoses prevent accumulation of liquids and chips and slotted holes in the cart base prevent pooling of fluid. For bigger sump pump system jobs like under the floor sump pits where sand-like semi-solid material forms when residual particulates and chips settle in the bottom of a sump, a continuous duty industrial sump vacuum cleaner system that facilitate high volume recovery of up to 5 tons per hour reduces the downtime necessary to remove sludge and protects workers from ergonomic issues associated with shoveling masses of sludge. These pits are ideal breeding grounds for harmful bacteria and fungus that endangers workers’ health, shortens the life of metalworking fluids, interferes with machine function and can eventually plug fluid lines. According to tool manufacturers, dirty machine coolant can cause a loss of as much as 10 percent of the cost of tools each year. There is no single industrial vacuum that does everything in the metals industry, but there are vacuum cleaning solutions appropriate for nearly every application. Consulting with an industrial vacuum specialist about machine center needs will lead to ideal solutions to increase uptime, create a healthier workplace and preserve expensive equipment and materials. If you are looking for a sump sucker or for more information about the new compressed air powered 55MW industrial sump vacuum cleaner for cleaning fluids or solids or a combination of both with the included VAC-U-MAX Chip Basket and Liner contact 1800-VAC-U-MAX (822-8629) or visit our website at www.vac-u-max.com.